Any man can be a Father but it takes someone special to be a DAD! We’re celebrating Dads all week at The Bombay Store! With Father’s Day just around the corner, The Bombay Store brings a wide range of gifting ideas for you. So what are you waiting for? Give him gifts that will make for great memories; memories that he will love and cherish all life! Knowing that it is not so easy to choose perfect gifts for the most perfect man in your life, we bring you a variety of unique & elegant Men Accessories. Cufflinks, Ties, Wallets, Ipad Sleeves, Laptop Bags, Shot glasses, Mugs, Deco pieces and a lot more products that would make for tasteful gifting options for your Father this Father’s Day! Not only this, along with the gift, you can also take him for a special Father’s Day treat at TGI Fridays. 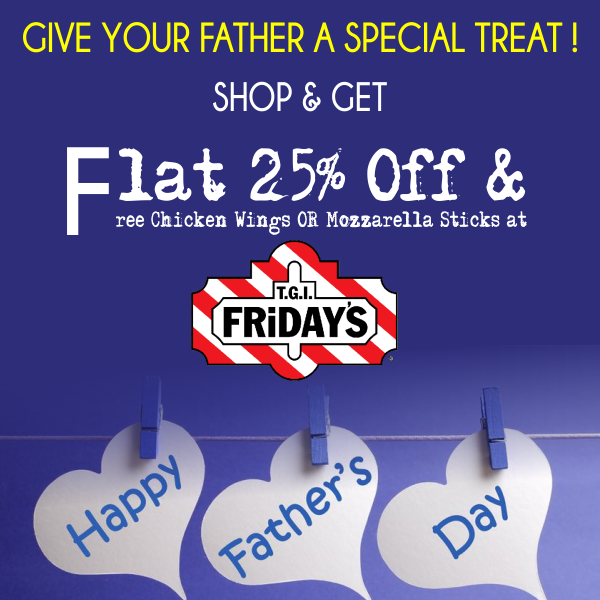 Shop and get TGI Fridays offer: Flat 25% off and Free Chicken Wings/ Mozzarella Sticks. This offer is valid at all The Bombay Store outlets and online till 21st June 2015. The celebration doesn’t end here; you can also participate in the Father’s Day contest happening on our social media channels and win exclusive gifts from The Bombay Store. SO GO AHEAD and give your Dad all that he wants this Father’s Day!